What some argue is evidence ofancient life in a meteoritefrom Mars could have a simple chemical explanation, scientists nowsuggest. These findings could also shed lighton of the trickychemistry going on in the atmospheres of both Mars and Earth. Impacting spacerocks on Mars over the years have hurled debris off theplanet, some ofwhich has landed on Earth. One such rock ? 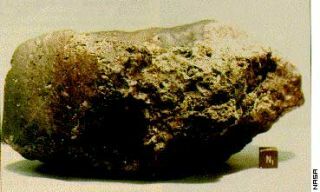 the 3.9 billion-year-oldmeteoriteknown as ALH84001? had globular, micron-sized carbonate particles seemingly arranged inchainsthat some thought must have been made by ancient Martian life. However, researchers have nowdiscovered a new way to formcarbonates on Earth without interference from biological organisms.Theysuggest this process likely takes place on Mars as well. Atmospheric chemist Robina Shaheen atthe University ofCalifornia at San Diego discovered anomalously high levels of oxygen-17incarbonates found on dust grains, aerosols and dirt on Earth as well.Thishinted that a chemical process common to both planets might be at work. Shaheencalculated that ozone inthe atmosphere could interact with oxygen-bearing mineral aerosols fromdustand other sources to form hydrogen peroxide and carbonates possessingthis sameoxygen-isotope anomaly. "What she found is that the tiny little layeronthe outside of the grain is where this chemistry all happens," saidresearcher Mark Thiemens, a planetary scientist at the University ofCaliforniaat San Diego. Shaheen'sanalysis of thecarbonates in ALH84001 suggested they could have been formed onaerosols in theancient Martian atmosphere. NASA's Phoenix lander recently detectedcarbonateslinked with particulates in the dusty atmosphere of Mars. "We think itmight be this same mechanism that is operating," she said. Althoughthe researchers think thecarbonate particles seen in ALH84001 are probably not biological inorigin,"that doesn't mean that lifeis impossible on Mars," Thiemens cautioned. Thischemical process might notonly shed light on the past and present of Mars, but it could also dothe samefor our planet as well. For instance, current models ofatmosphericprocesses on Earth assume that the mixing of large volumes of gasesdrives thechemistry of the Earth's atmosphere. This new work might force arethinking ofthis idea, scientists said, especially as the Earth's atmospherebecomes warmerand dustier due to climate change, providing more opportunities forthis kindof chemistry to take place on aerosols. "Thechemical transformationsaerosols can undergo could make them seeds for cloud formation whenbefore wethought they could not, which has huge implications regarding the watercycleand probabilities of rain," Shaheen told SPACE.com. Scientistscould also peer intoEarth's atmosphere as it was in the past, particularly its oxygenlevels, byexamining carbonates found in rocks that are hundreds of millions ofyears old,researchers said. This could provide a window to early Earth far beyondthe60,000 years or so back that scientists can now study via ice coresamples. "We'vefound a new way tomeasure the earth's atmosphere for time periods when we previouslycould not doit," Thiemens said. "What happened to ozone and oxygen levels 65million years ago during the Cretaceous-Tertiary period when thedinosaurs andmany other forms of life were killed in a mass extinction? Who diedfirst? Didthe food chain disappear before the dinosaurs? What happened 251million yearsago during the Permian-Triassic period, the most severe extinction oflife onEarth, when 85 percent of life disappeared and no one knows why?There's norecord of what happened in the atmosphere. But if you can find a recordof whathappened to oxygen levels, you can answer questions like that." Ancientcarbonate might even shedlight on the originsof complex life, Thiemens said. "Ifyou want to understandthe origin and evolution of complex life, oxygen is your number oneculprit," Thiemens told SPACE.com. "The most interesting timecarbonates might be able to look at would be about 500 million yearsago, backwhen the Earth was frozen solid. Prior to that time, there's no lifeexceptalgae and bacteria. After that, all this life that depends on oxygenappears,and how that happened is something that's still uncertain." Shaheen,Thiemens and theircolleagues detailed their findings online Nov. 8 in the journalProceedings ofthe National Academy of Sciences.